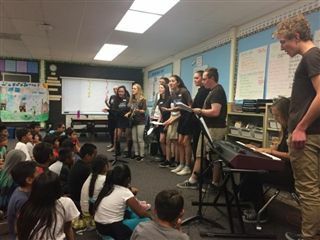 Upper School Service Learning groups On Pointe and Notes of Hope share a similar mission - to spread joy and inspiration through the power of the performing arts. On Wednesday, April 20th, the groups teamed up to put on music and dance performances at Alvin Dunn Elementary School in San Marcos. The third grade audience members were spotted dancing in their seats during On Pointe's contemporary piece, and singing along to Notes of Hope's rendition of Justin Bieber's "Love Yourself." After the performances, the students received many high-fives and hugs from their new fans.